VirtualBox 4.1.12 has been released and with it, the VirtualBox repository has been updated to support the latest Ubuntu 12.04 Precise Pangolin, even though this isn't mentioned on the VirtualBox Linux downloads page yet. The latest VirtualBox 4.1.12 brings mostly bug fixes, but it also adds support for Linux Kernel 3.4 RC1 (guest additions). For a complete changelog, see THIS page. 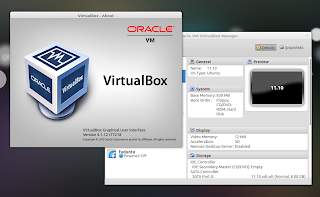 Optional: starting with VirtualBox 4.0.x, some features like VirtualBox RDP and PXE boot for Intel cards support as well as USB 2.0 devices support are available separately, in an extension pack. 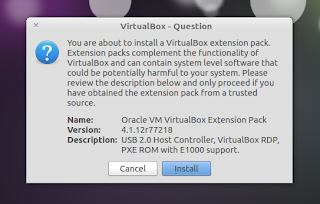 You can download the VirtualBox Extension Pack from HERE. To install it, simply double click the extension and VirtualBox should open, prompting you to install it. If that doesn't work, you can also select File > Preferences > Extensions and browse for the downloaded VirtualBox extension. For other Linux distributions, Windows and Mac OSX, you can get VirtualBox from its download page. Also see: How To Get Your USB Drives To Work With VirtualBox (Ubuntu Host) (Ubuntu 11.10 and 12.04 instructions included).